Dolphins attract tourists to Egypt every year, but despite their popularity, are still poorly known from a scientific point of view. Eight species are considered regular: Common Bottlenose Dolphin (Tursiops truncatus), Indopacific Bottlenose dolphin (Tursiops aduncus), Spinner Dolphin (Stenella longirostris), Pantropical Spotted Dolphin (Stenella attenuata), Longbeaked Common Dolphin (Dephinus capensis), Risso’s Dolphin (Grampus griseus), Humpback Dolphin (Sousa chinensis) and Bryde’s Whale (Balaenoptera edeni). Other height species are considered rare (Notarbartolo et.al. 2007). 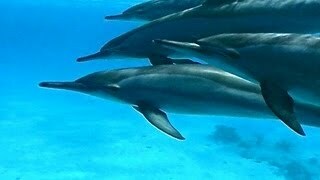 There are various sites in the southern Red Sea where Dolphins congregate or live. Sammadai national park and Satayah reef are the most well known and both sites are home to spinner dolphins. It is very common to spot these beautiful creatures roaming about the sea anywhere in the south. They are usually very playful and will approach closely so long as you stay calm and respect the dolphins space.